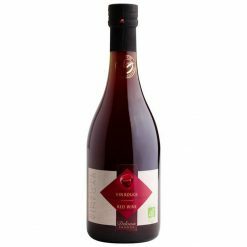 Made with organically grown grapes and elaborated in a traditional way, this vinegar is full-bodied, with aromas of red fruits. It develops its richness in marinades. DelouisEE vinegars and mustards are all authentic, natural and organic. Its mustards have won prizes at the Napa Valley World-Wide Mustard Competition for six consecutive years (1995-2000) and are used by leading chefs. Its vinegars, too, long ago won awards, in 1885, 1922 and 1924. Established in 1885, Delouis is a family business with more than 125 years of history. Georges Delouis, who began the production of vinegar, was succeeded by his son, Pierre, and subsequently his grandson, Philippe. In 1976, Philippe launched the production of vinaigrettes, sauces and mayonnaise, and restarted the production of mustards. Today, with Gael Brabant as company president, Delouis is led by two fundamental principles: innovation and respect of French gastronomic traditions”he company complies with the strictest quality and environmental requirements, and its organic products are certified. The company has been growing for the past 30 years thanks to its research and development department, which is continuously looking for new products to meet or exceed customer expectations. Those innovations have enabled Delouis to be a leader in new markets. Thanks to the innovation department and a close relationship with top French chefs, Delouis continues to offer new ideas and quality products.